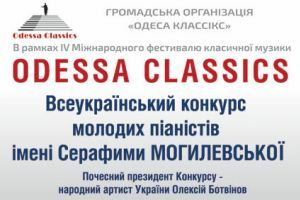 Young Ukrainian Pianists Competition took place for the 1st time on May 26 - 28 as a part of the 4th ODESSA CLASSICS International Music Festival. The Contest is a tribute to the memory of the outstanding teacher, professor of the Odessa Conservatoire Serafima Leonidovna Mogilevskaya. She brought up a whole galaxy of talented pianists with an international fame, among them there are A. Botvinov, F. Lyubarsky, M. Legotsky, Eugene Mogilevsky and others. Ukrainian pianists at the age of 11-15 years was invited to participate in this contest, regardless of the institution they attend, the form of training, the level of academic achievement, the availability of recommendations from the musical school. The competition is not a commercial event. There is no entrance fee for participants. However, the most important prize for the winner is a possibility to perform with the adult star musicians who participated in ODESSA CLASSICS Festival. On June 8, 2018 the winner performed at the open-air concert alongside with Zakhar Bron, Alexey Botvinov and Berlin Chamber Orchestra conducted by Michael Guttman.